Melbourne's Hamer Hall - the city's premier concert venue - has undergone a major refit, renovation and redesign to many of its public spaces. Its (re)-opening season is about to begin, almost exactly thirty years after the hall was opened as the Melbourne Concert Hall. Comparing the highlights of the 1982 opening season and those of the 2012 re-opening throws an interesting light on programming tastes then and now. 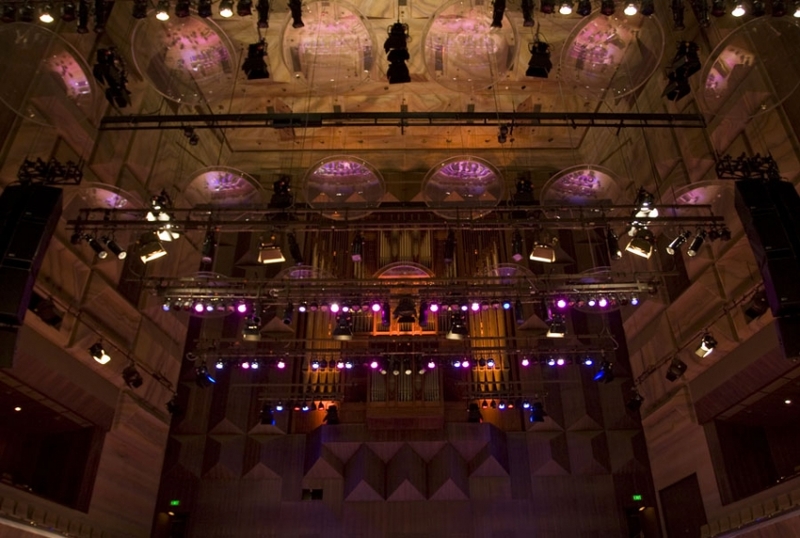 The first ever concert in the hall - one for the workers who built it and their families - featured singers Karen Knowles and Suzanne Steele, dancer Jackie Love (click on her name to see a video), the pianist Roger Woodward and the Melbourne Showband. The compere on the night was Jimmy Hannan. The foyer of the hall was also home to an exhibition celebrating the life of Dame Nellie Melba, one of Australia's most famous singers. According to The Age newspaper the later official opening concert saw "streamers bur(y) the orchestra and a robot serve the guests nuts and bolts." But not everyone was happy. The music critic of the same paper (Kenneth Hince) wrote of the "outrageous fortune" suffered by the orchestral strings and asked "can we cure the sound and turn a major social asset into a decent concert hall?" Concerns about the hall's acoustics have long been a concern but the word is that the new fit out has finally fixed the problems. In 1983 the London Symphony Orchestra made a visit with their conductor Claudio Abbado, in 2012 it is the turn of the Czech Philharmonic. In 1982 the first performance on the hall's concert organ was another of the highlights. As part of the 2012 renovation the organ was removed. Features of the 2012 celebrations include performances by Phillip Glass, Shine pianist David Helfgott and concert performances by the Cape Town Opera. Rufus Wainwright is also on the bill along with Macy Gray and Nitin Sawhney.